2 studio flats on 1st floor of house (25m²). 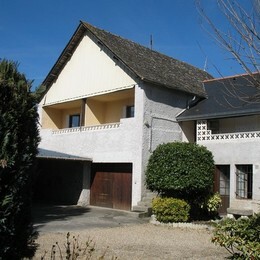 In centre of small village (tennis courts), in Béarn countryside close to mountains, 1km from leisure activity centre (lake, beach, fishing, canoeing, etc. ), 10km from Pau and 27km from Lourdes. 1 room with double bed and fully equipped kitchenette, 1 shower room with WC. Covered parking space, balcony, shaded garden with garden furniture.